For the second time, I am hooking up with the latest One Room Challenge linking event sponsored by Linda at Calling it Home. Six weeks, one room. The objective? Transform a room without losing your mind and/or husband. Six weeks sounds like a lot of time -that's like half way through May, but believe you me, it's a nanosecond in decorating/remodeling time. I've chosen my upstairs landing/hallway for this challenge. This should be a fun project because it will be mostly about sprucing and fluffing rather than a major gritty, overhaul like my last ORC. This landing is actually pretty big and acts sort of like a library/work zone rather than a byway. I want to make it even more so. I often eat my lunch at this table because the light is really great up here (there are skylights above the stairs leading to the top floor). Right now it looks pretty haphazard -the proportions of the desk are wrong, the lighting is basically nonexistent and a rug would be great to name the obvious. (Incidentally, that second desk you see in the farther hallway is not usually there and is temporary, but that is a whole nother story. I'm actually planning on shuffling around a lot of furniture for this redo). My design objective is to turn this space into a cohesive room that looks well thought out and polished. I plan to stay within my usual aesthetic which I would describe as sparsely eclectic, but I need to balance things out so that this hallway doesn't just look like a repository for random stuff and furniture. For now, my first major decision is whether or not to paint the bookshelves. I'm uncertain as to whether it is worth the effort because they don't need paint it's just I'm kind of itching to change the color a little. I'm also on the hunt for some lighting and a rug and possibly a chair or two. Be sure to check out all the other participants here, it's so fun to live vicariously through others. Another amazing space?? You blew me away with the shed, can't wait to see this one too! paint them! go for it! cant wait to see the afters!!! I'm glad you mentioned that. I better get chopping, like tomorrow. What a fun little space to do! I love when spaces are used unexpectedly, so many would leave this area blank. I love your library. That space has so much potential. Beautiful light, and you already have some great accessories. Love that map. Excited to follow along. I'm excited. I think it looks good now so I can't even imagine what it will look like after sprucing! I love that your landing is so huge- its like an extra room. Thanks Traci :) you made my day. I've been wanting to do this space forever and am glad to have the impetus to finally get it done! Hopefully it will look better…. ;} Hard to tell in the pictures I posted but the symmetry is really off in this room because the stairway is centered in the room but the bookshelves are not. It feels a little wanky. Hi Caitlin, it's nice to see you at this again. 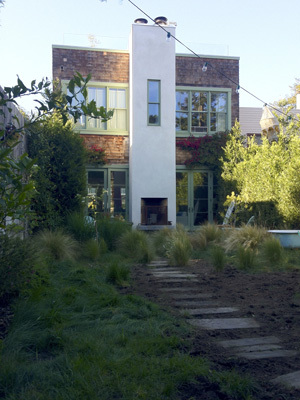 Seriously, a multi-level home in SF....I'm in! I love how the skylight shines down the stairs. This would be one of my favorites spaces. I am looking forward to following along. Since I am in a 'paint everything white' phase, I am no help with the bookcases. For a "hallway", that space is awesome! You killed it with the shed, so I know this library/office is going to look fabulous! Good luck! What a cool space! Looking forward to following your progress.